The loaches are very interesting fishes. They can be somewhat on the sensitive side regarding water quality and many are wild caught because they can be difficult to breed. Many species often develop freshwater ich and the use of a quarantine tank before acclimating them to your main tank is strongly recommended. Keep your water quality up, which means no ammonia, no nitrites and very low nitrate readings with your aquarium test kit. Many are scavengers and will do well on a varied diet. The Clown Loach is very good at snail control, quickly ridding the tank of any unwanted snails. Some loaches are stay small (i.e. 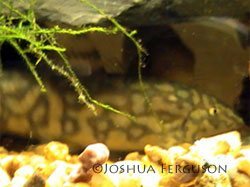 the Borneo Loach), but some such as the Clown Loach can grow to be over a foot in length and live for a very long time if kept properly! Please research all your fishes before you bring them home from the pet store. 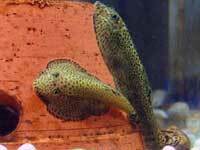 The Clown loach is a loach with tons of personality that needs to be properly acclimated to your larger sized tank. Also known as the weather loach because of their behavior during low fronts in the weather system. A somewhat reclusive loach that needs current and highly oxygenated and cooler tank water. A smaller sized loach that does well in many freshwater setups. The Yoyo Loach (Botia almorhae) is a very active and friendly fish that makes a good addition to any community aquarium.